When my Great Grandfather Harold Kester ran the pharmacy back in the 1950s, there were about 10,000 people in living in Naperville. Residents had three pharmacy choices: Oswald’s, Albrecht’s or Naperville Pharmacy. If you were new to town, you most likely chose where to get your prescriptions filled through word-of-mouth. Outside of conversation, perhaps you’d see an advertisement in the local paper, the Naperville Clarion. Fast forward seven decades and it’s no surprise that the world we live in is quite a bit different! Some of these differences are apparent when it comes to deciding where to get your prescriptions filled. Top of mind pharmacies most new residents think about would be the chains: Walgreens and CVS. Next would be the “grocery store pharmacies”: Jewel-Osco, Costco, Target, and Walmart. If you’re in need of any specialty drugs or compounds, your insurance provider often dictates where you can get prescriptions filled. You may even go the mail-order route; Express Scripts, OptumRX or Caremark . Those who do a bit of research, however, will discover the best kind of pharmacy… an independent! Here at Oswald’s, we’re proud to be an independent pharmacy, thriving in our 144th year in business. We’ve been owned and operated by the same family since 1883 (purchased by my great-great-great-Grandfather William Wallace Wickel! ), with the store originally opening in 1875. 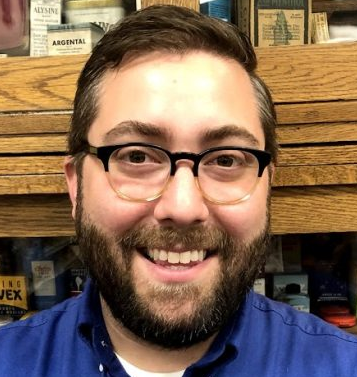 If you’re lucky enough to discover a great independent pharmacy in 2019, you’ll be asking why you weren’t on the lookout sooner. In a recent Consumer Reports article, which interviewed 78,000 CR readers, they wrote: “Independent pharmacies earned high scores on measures like courtesy, helpfulness, and speed of checkout and filling prescriptions.” Pharmacists’ knowledge and time spent with the customers also earned high marks from CR. At the bottom of the article for customer care? “large national chain pharmacies”. 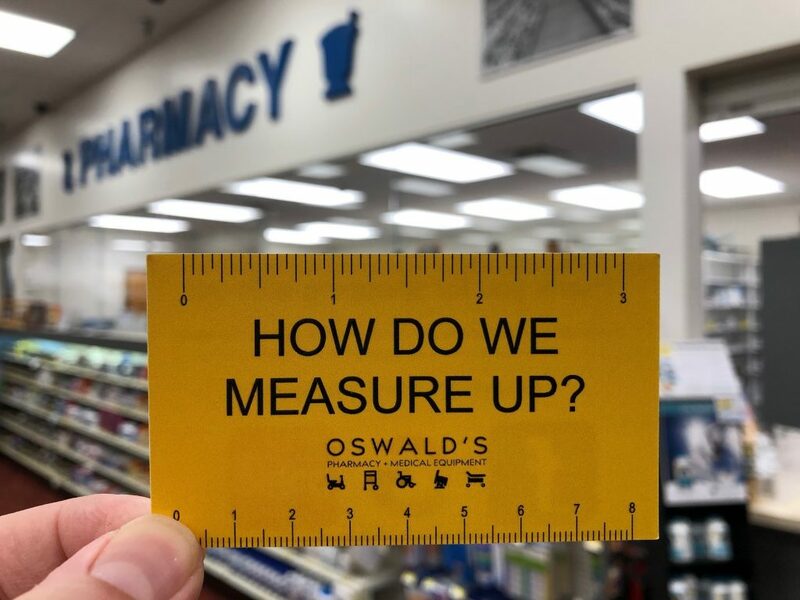 Customer care is a difference you’ll notice as soon as your first prescription is filled at a local pharmacy like Oswald’s. We also focus on wellness in a way the chain pharmacies can’t. How? We have a large medical equipment showroom, unique product curation that digs deeper than the ‘top sellers’ on the shelves at every chain pharmacy and offer free prescription delivery to Naperville residents 5 days a week. While word-of-mouth is still important, the world of ‘new media’ has dramatically changed the way we communicate with our customers. We’ve traded the days of newspaper advertising, seemingly overnight, for all things digital. Even word-of-mouth has gone digital. Inc. Magazine wrote that “research shows 91 percent of people regularly or occasionally read online reviews. More striking than that, “84 percent [of people] trust online reviews as much as a personal recommendation.”  Have you used Facebook, Google or Yelp to learn about what others think of your current pharmacy? We have! The closest Walgreens to us (87th street) holds a 2.1/5 on Facebook, a 2.6/5 on Google, and a 2/5 on Yelp as of 1/2/2019. Oswald’s holds a 4.9/5 on both Facebook and Google and a 4.5/5 on Yelp. We take these reviews very seriously and strive to offer the best service possible each and every day. With the world around us continuing to change, our role in supporting the community has remained strong. We are actively involved with sponsoring local events, raising money for Naperville non-profits, and throwing fun events for the community! Oswald’s current owner, my father Bill, has served as Rotary President, as have the two previous owners (my Grandfather and great-Grandfather). Bill has also been heavily involved with the Downtown Naperville Alliance and is a former Naperville Riverwalk Commissioner. I give back to the community as a member of the Naperville Jaycees and Little Friends auxiliary board. We even like to give a ‘lift’ to past employees in need of a helping hand. If you’re not currently a customer, please give us a call and press 0 to speak directly to one of our pharmacists. We’d love for you to see the difference an independent pharmacy like Oswald’s offers. We’re more than happy to help you transfer your prescriptions! If you’re already a customer, why not let your ‘digital’ peers know how we measure up?